Hundreds of thousands of years ago, man stumbled across the invention of fire. Since that time, it’s been used to warm homes and shed light. It’s also been used to cook burgers, ribs and chicken. Although, the grill made its debut on the scene quite a few years after fire did. Everyone is used to grilling meats, but what about fish? Well let’s take a break from living off the land and dive into the water. Fish is quick and simple on the grill — and if you add mesquite chips to the grill, your dish will get a unique flavor. The smoky flavor will make the fish jump off the plate and explode in your mouth. 1. Cover 1 cup mesquite chips with cold water; soak 20 to 30 minutes. Spray grid with nonstick cooking spray. Prepare grill for direct cooking. 2. Combine oil and garlic in small microwavable bowl. Microwave on HIGH 1 minute or until garlic is tender. Add lemon juice, lemon peel, dill, thyme, salt and pepper; whisk until blended. 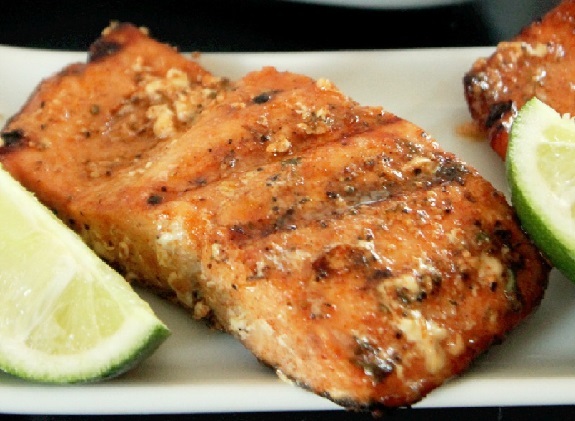 Brush skinless sides of salmon with half of lemon mixture. 3. Drain mesquite chips; sprinkle chips over coals. Place salmon, skin side up, on grid. Grill, covered, over medium-high heat 4 to 5 minutes; turn and brush with remaining lemon mixture. Grill 4 to 5 minutes or until salmon flakes when tested with fork. Salmon is my favorite fish. This looks so yummy. Perfect, just what I was looking for!